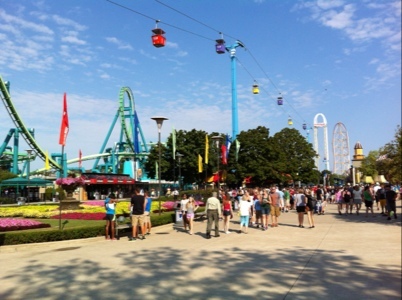 Last stop on the coaster tour was appropriately, Cedar Point, voted the best amusement park for 14 years in a row. Because we were all feeling the effects of a week of traveling and being tossed about on various contraptions, we took the morning slow. 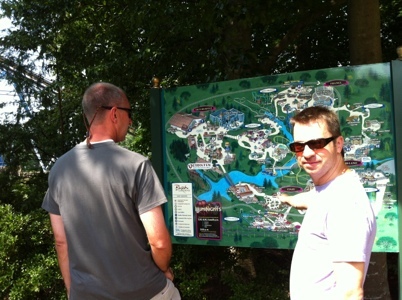 A leisurely ride on the sky ride and a walk around the park helped us get our bearings. As you can see, the weather was perfect for a day at the peninsula. 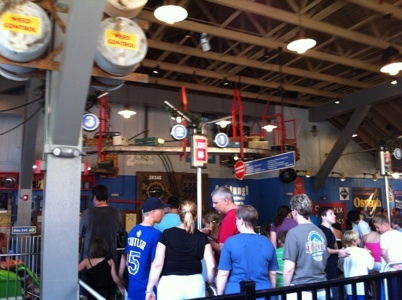 First stop was Maverick, a cool launch coaster that you really need to learn how to ride properly to enjoy it. You sort of lean into the turns and inversions, and that makes all the difference. 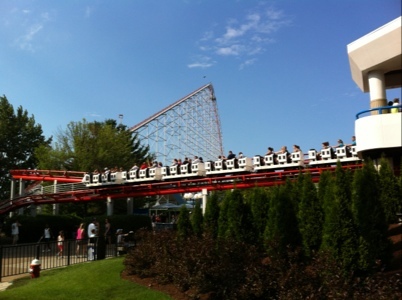 Next was Top Thrill Dragster, the tallest and fastest coaster on this trip. Some say it’s a one trick pony, but that one trick is pretty darn cool! 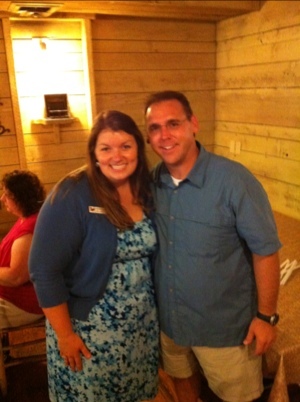 Big thanks to Rebecca Baker (Marketing, Cedar Point) for coming out to say hello. It was great seeing her and catching up! Apparently, Alan is teaching Snoopy how to share. Rebecca recommended we check out the incredible light show on the Cedar Point Giant Wheel. This is just a small portion of the show. Enjoy! 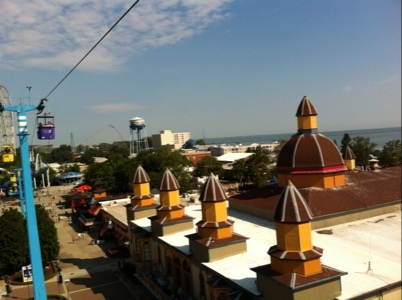 To finish out CoasterNerdCon 2012, we took one last ride on Top Thrill Dragster. It was the perfect end to a great trip. Can’t wait for the next one! We’re clear, and we’re outta here! 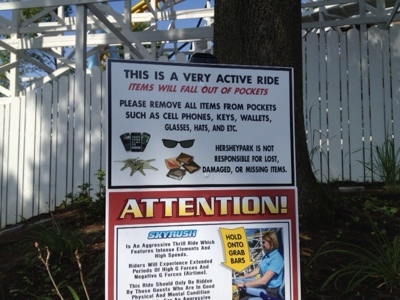 Oh, Kennywood! 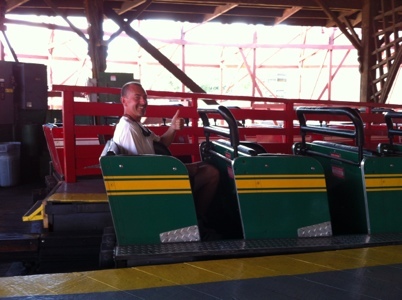 We only had a half day to play at Kennywood, so we made every minute count… including the unique conveyance from the parking lot to the main gate. 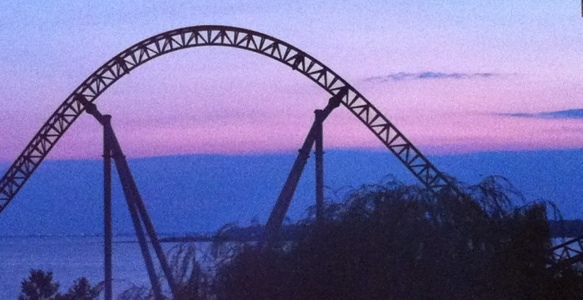 What a great view of the first two hills of Phantom’s Revenge! 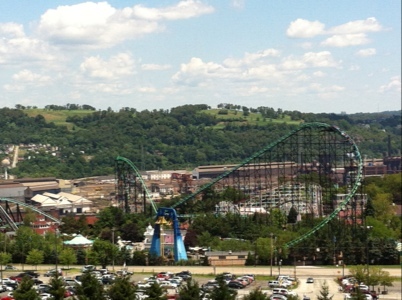 Kennywood is a great example of a trolley park that survived and is now all grown up! 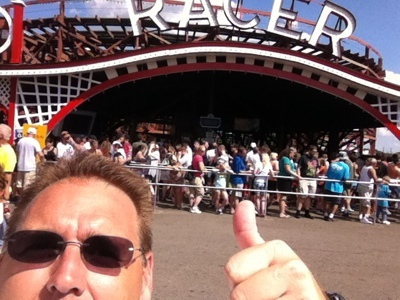 Last time I was at Kennywood, the Steel Phantom roller coaster was the new kid on the block. Travelling 200+ feet down a cliff at 80 mph was a great thrill. Now, it’s been converted to the Phantom’s Revenge with a lot of track being replaced and entire sections reprofiled. 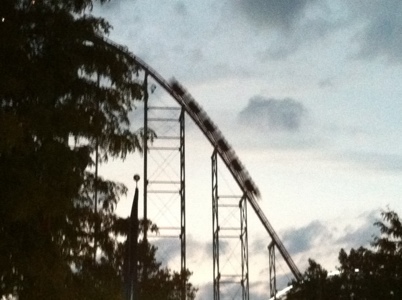 It’s still got the mega drop, but now it’s also got airtime and some cool speed elements. Collectively, we approve of the changes! 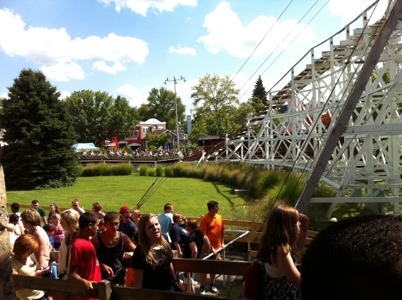 Kennywood also has a great collection of some old-school wooden coasters. 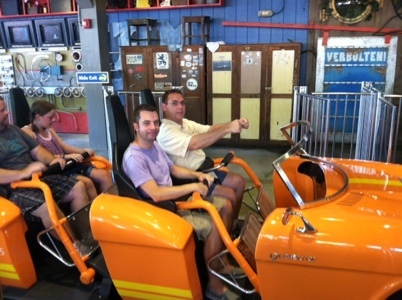 Our first stop was the Thunderbolt. 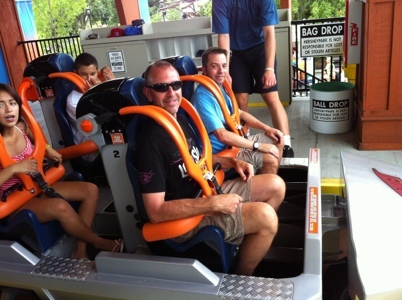 Then the Racer… one of only three continuous track racing coasters in the world. Meaning, if your train starts on the left side of the station, it will return on the right. Still not sure how that works. The Racer was built in 1927 and is listed as a National Landmark. The station is still as it appeared when it was first opened. Darren likes that. 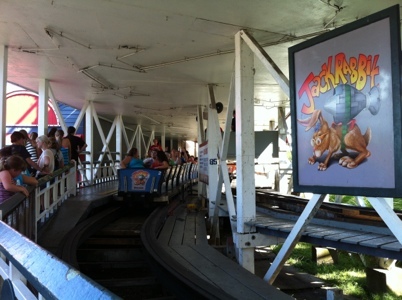 Last but not least was the Jack Rabbit! 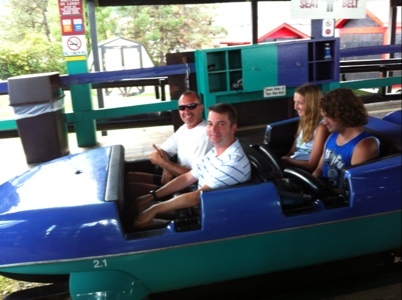 A fun terrain coaster that boasts a double dip with tons of airtime! To this point in the trip we have been to 7 parks and have ridden 36 coasters. 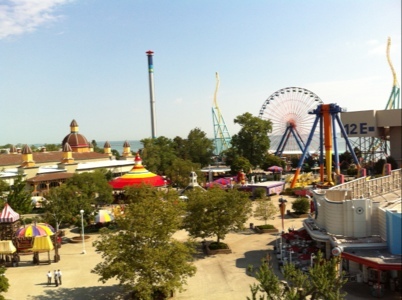 Tomorrow will be park #8 with a bevy of great coasters to keep us busy all day! 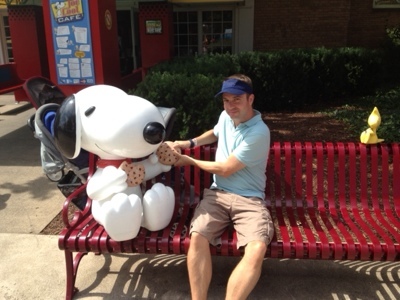 Having never been to Hershypark, I wasn’t sure what to expect. I quickly realized this is not just an ode to chocolate (although chocoholics can certainly satisfy their craving at just about every turn). The park was beautiful, the employees were friendly, and while you are in the land that Hershey built, they don’t beat you over the head with it. 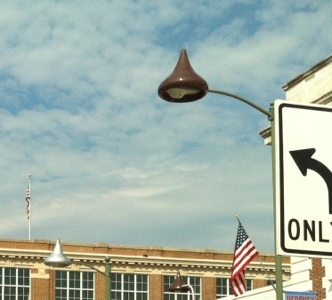 Okay, maybe a little… the street lights are Hershey Kisses, alternatively wrapped and unwrapped! Very fun! 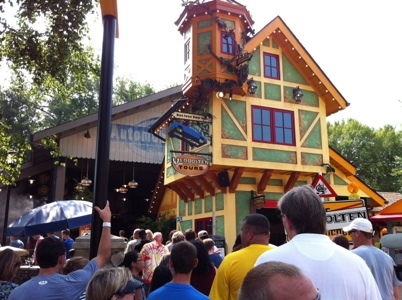 The entrance is reminiscent of the German section of Busch Gardens. I really liked how they have a whole themed and named area before you even go through the gates! 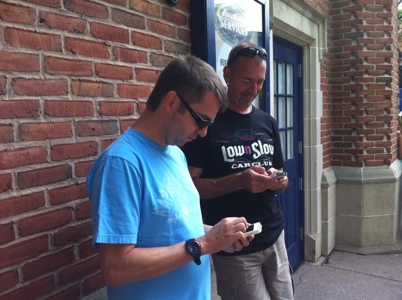 This is what the other two yahoos do while waiting for me to get the tickets. 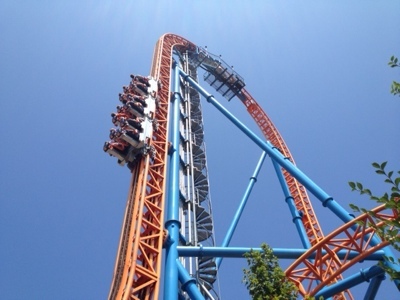 The star of the show today was Sky Rush, Hersheypark’s newest coaster. 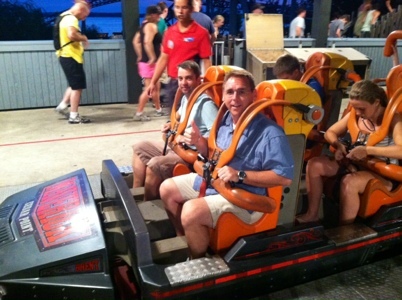 It was fast, smooth, and delivered some “aggressive” airtime. If you are going to go, take this warning seriously. Alan and his sunglasses found out the hard way. 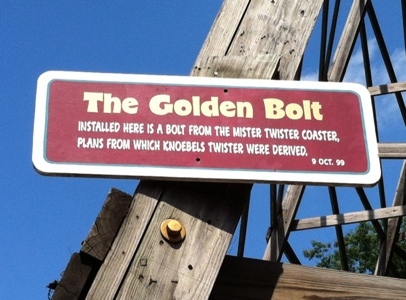 Some other favorites were Fahrenheit, Lightning Racer and Storm Runner. 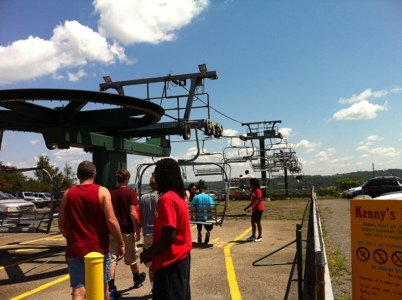 Getting ready for the vertical ascent on Fahrenheit. 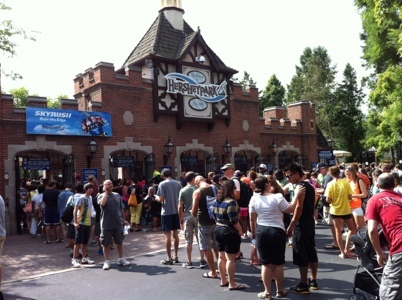 We all commented as we were leaving that Hershypark really is a multiple day destination. 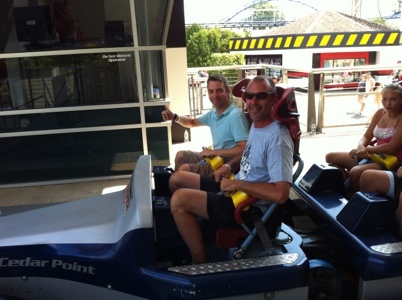 With all the park has to offer, along with Chocolate World and the history of all things Hershey to explore, you really need a few days to see and do it all – and I highly recommend it! 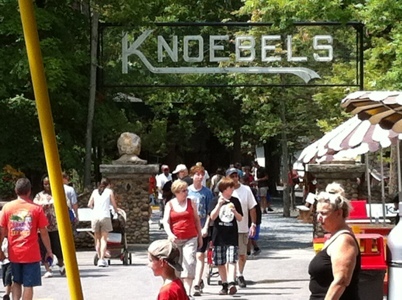 If you are a fan of amusement parks or carousels, Knoebels has a few things of special interest to you. 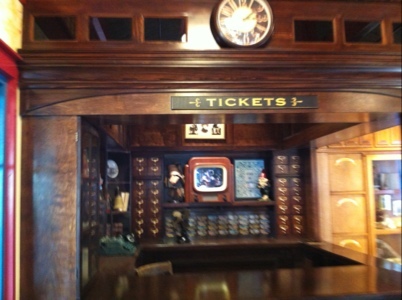 They have a carousel museum, a Knoebels museum, and a collection of attractions and fixtures from many historic parks. It’s worth a trip for all that alone. 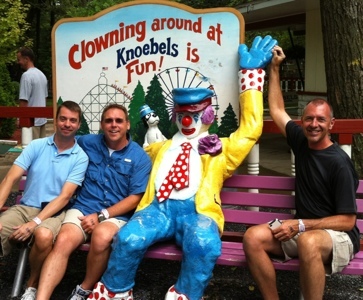 Getting ready for a fun day at Knoebels! 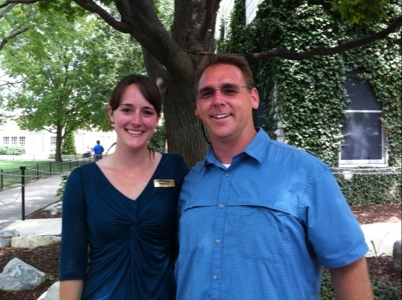 This is Leanna Muscato, our tour guide for the day! 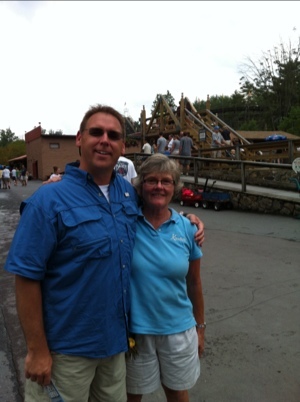 The history of Knoebels and carousels was fascinating!! We conquered the very well done haunted house. Even we jumped a few times! Of course they have two great coasters. 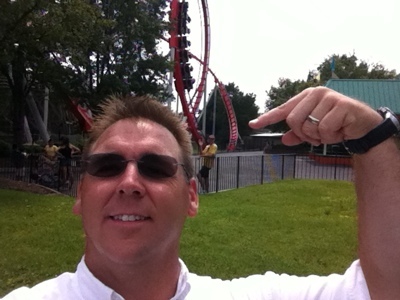 First was the Twister, a replica of Mr. Twister from Elitch Gardens in Colorado. 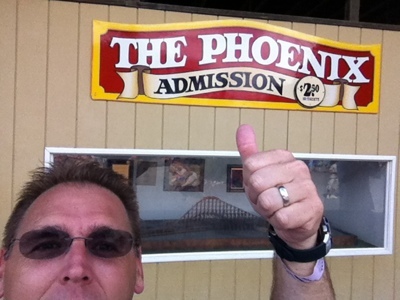 Then there is the Phoenix… More amazing airtime, just a super fun coaster! One of the greatest highlights for me was getting to reach for the brass ring on their carousel! 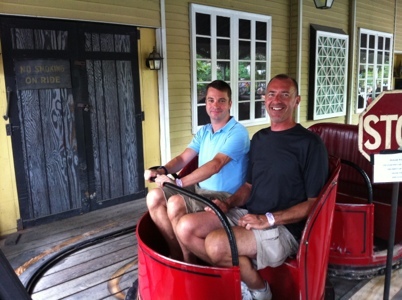 Knoebels is one of only two parks that actually let you do it. 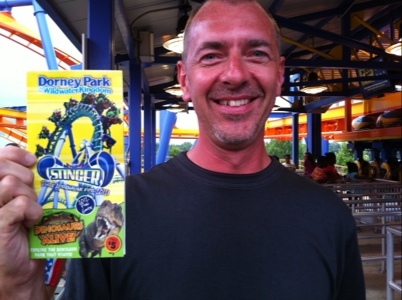 And then there’s Dorney Park! Many (including us!) said we couldn’t make it to both parks in one day, but we did! We had a little rain, but that didn’t stop us. 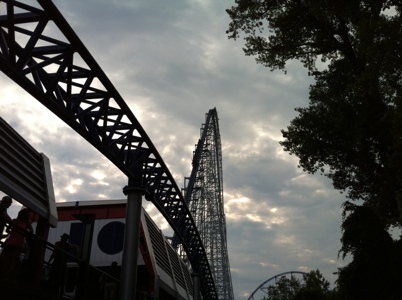 Here is Steel Force with a cloudy backdrop. 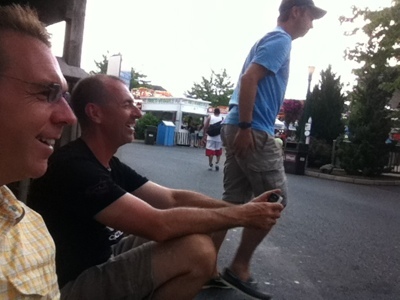 When all was said and done, we spent 1 hour and 59 minutes at Dorney and rode 7 coasters (Steel Force and Talon twice). It was a good day! 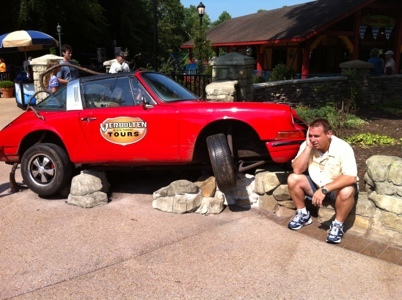 Busch Gardens is consistently voted the most beautiful theme park – with good reason! 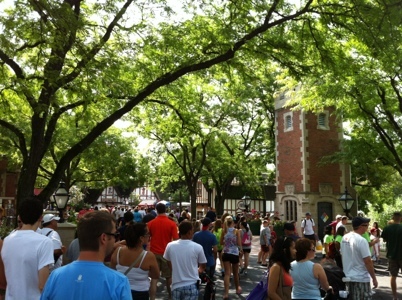 But, today was not about pretty flowers… It was about coasters! 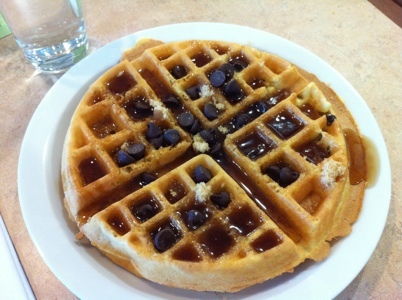 First, today’s waffle… With chocolate chips. 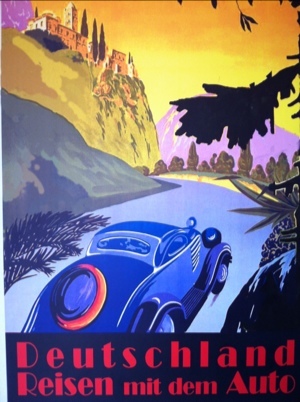 Love this picture that’s in the queue at Verbolten. We were all very impressed that every employee we saw waved as we rode by on the train. This is one little example, and not even the best one, just the one I captured! What coaster nerds do in the presence of a great coaster (Alpengeist). 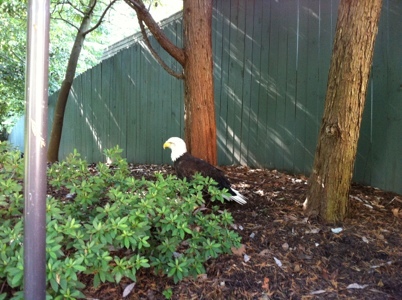 One of the eagles that Busch Gardens helps to rehabilitate. Three parks down, five to go. 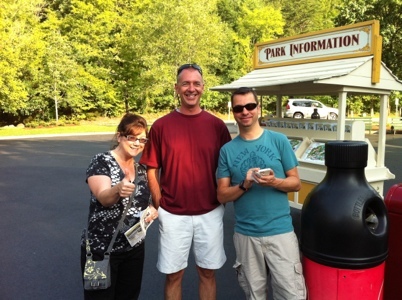 Next we’ll hit two parks in one day… Knoebels and Dorney Park. Gonna be a long (but FUN) day! 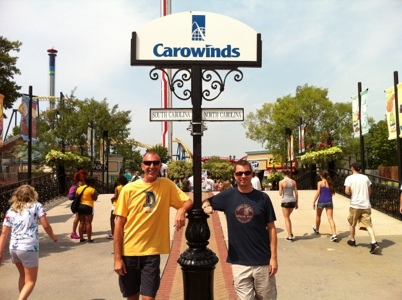 Had a great day at Carowinds– we just love exploring parks we’ve never been to. 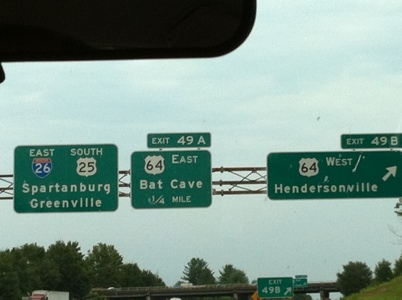 Speaking of exploring, this is something we’ll have to investigate the next time we are in the area. Apparently, the location is no longer a secret. 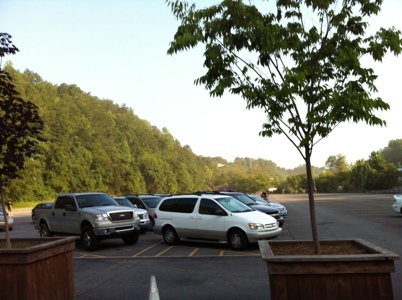 What a lovely site to see when you first pull into the parking lot! Intimidator!! 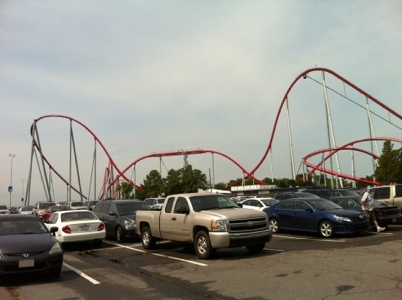 Intimidator has GREAT airtime, both in front and back! 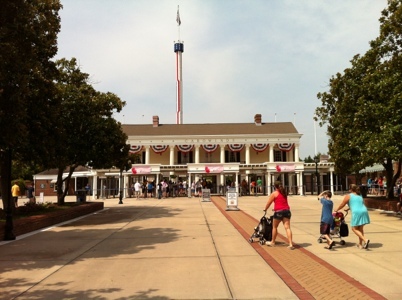 Carowinds has a very unique front gate. The line on the ground indicates the state line of North and South Carolina. 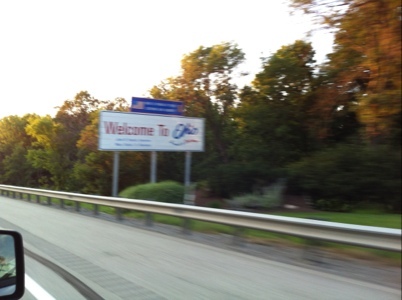 All day we went back and forth between the two states. 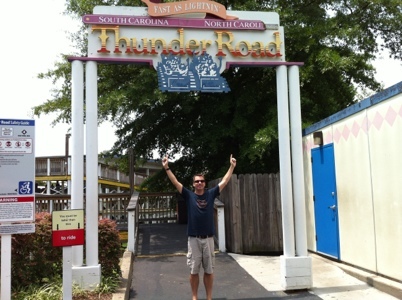 Thunder Road (wooden racing coaster) actually starts in South Carolina, goes to North Carolina, turns around and comes back to South Carolina. 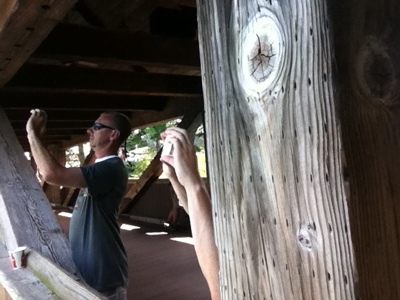 Last but not least, a little photographic trickery. 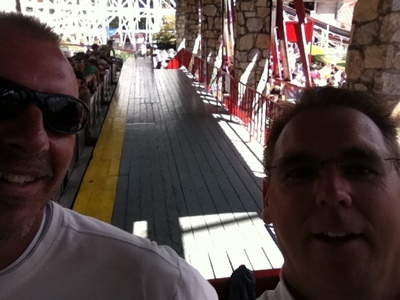 That’s Darren in the yellow shirt, after a ride on Vortex, the stand-up coaster. Two parks down, six to go. Next up: Busch Gardens! 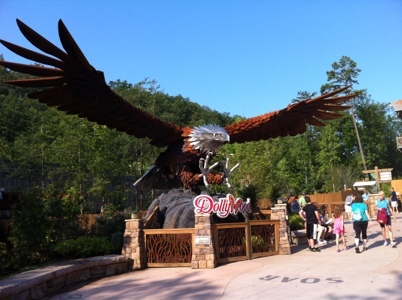 Day 1 of the trip at Dollywood – first ones here! Linda, Darren and Alan look like they are ready. Ashley Adams came out to say hi! 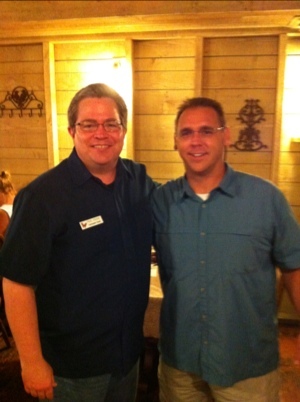 Paul Couch, the dude responsible for all the great shows at Dollywood. The Dreamland Drive-In show was amazing!! 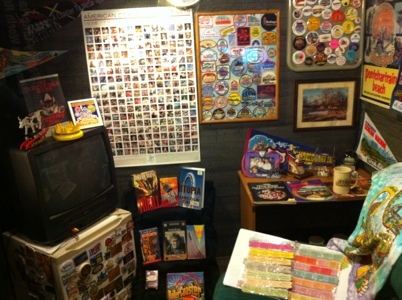 The Roller Coaster Museum was set up at Dollywood… Could have stayed in here all day… If it weren’t for real roller coasters outside. 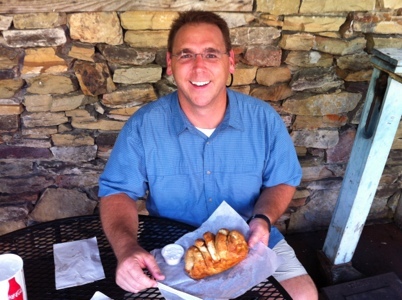 AMAZING cinnamon bread from the Grist Mill. Thank you @themeparkfoodie for the recommendation! 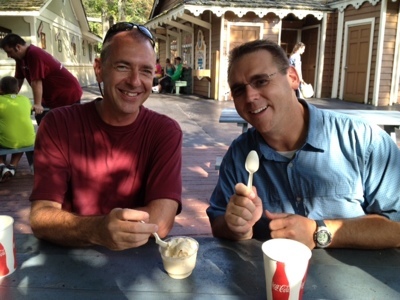 And… The best peanut butter ice cream on the planet!! Now on the road to Carowinds!! My first video post. Please be gentle. Side note: You’ll notice that I am wearing the same shirt in the video on the Myth of Mid Season Burnout page. That’s the video that seemed to be going so horribly wrong and inspired me to do this one. Luckily, I was able to find some salvageable clips. Whew! 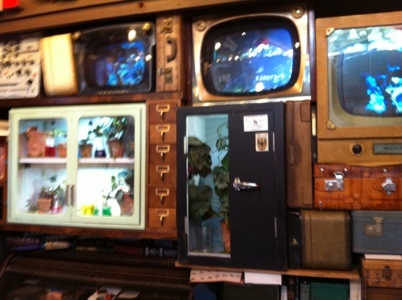 Thanks for reading… I mean WATCHING!!! You can’t tell me service is dead! The people who claim that customer service is dead and weep for the future of our society have not met Josh Patterson. Josh was our Sales Consultant at Carmax this weekend when we went looking for some new wheels. Let me tell you about Josh. He’s a youngster… just 22 years old and has been with Carmax for 2-1/2 years. He just started working in sales in January and before that he worked in inventory. He was knowledgeable, friendly, open, concerned about our needs, patient and accommodating. Is there anything else you would want from a service experience? After all was said and done, I think we spent 5 hours with Josh. Walking the lot, kicking tires, taking test drives, asking about this and that, and sometimes confusing ourselves with all the details. Josh kept it all straight, answered our questions and made the whole process smooth and easy. What really struck me was the way that Josh talked about Carmax. He genuinely enjoys working there, feels like he is supported by the company and sees opportunity for growth. The funny thing is that he didn’t really say these things as much as he implied these things. And of course, I was watching and listening for clues! The naysayers may say that Josh is the exception to the rule. Okay, but what about Eli, the gentleman from the Carmax service department who was kind enough to speed my car to the front of the line without an appointment for a small buffing issue that was missed during the initial inspection? Then, he politely explained about making an appointment next time – he didn’t make me feel stupid or punish me for not knowing any better. Or then there is Rene, the cashier at CVS around the corner from Carmax. I saw him interacting with two customers before me, both who spoke Spanish (as did Rene) and he treated them both as if they were friends, family members, or at the very least, repeat customers. When I walked up, it was clear and cheery English that came out of his mouth and he was equally warm and friendly with me. Last but not least was a young lady at Home Depot, just down the road from CVS. I was heading to the self check out, and she greeted me with a smile, scanned my items for me and put them in a bag. She did the same thing for another customer just after me. Granted, self checkout is supposed to reduce the amount of cashiers, but the assistance was greatly appreciated. My point to all this? Customer service is not dead! Let the naysayers wallow in their negativity and doom and gloom. They aren’t looking for good service, so they’ll never find it. But maybe they have done us a favor… Maybe companies have started to wake up and take heed of those who say that service is dead, and they are doing something about it. Are you doing anything about it, or are you one of the companies the naysayers are talking about? Leave us a comment about what you are doing to improve service.